Alexander (Greek: Αλέξανδρος, Alexandros, 870 – June 6, 913), sometimes numbered Alexander III,[note 1] ruled as Emperor of the Byzantine Empire in 912–913. He was the third son of Emperor Basil I and Eudokia Ingerina. Unlike his older brother Leo VI the Wise, his paternity was not disputed between Basil I and Michael III because he was born years after the death of Michael. 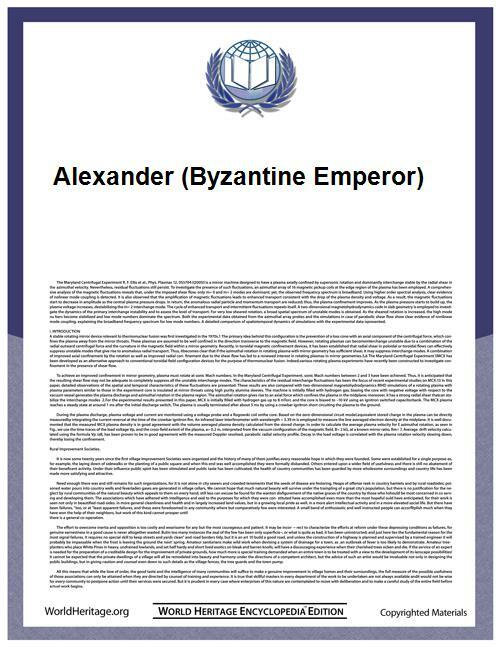 Alexander was crowned co-emperor by his father in about the year 879. Upon his brother's death on May 11, 912 Alexander succeeded as senior emperor alongside Leo's young son Constantine VII. He was the first Byzantine emperor to use the term "autocrator" (αὐτοκράτωρ πιστὸς εὑσεβὴς βασιλεὺς) on coinage to celebrate the ending of his thirty-three years as co-emperor. Alexander promptly dismissed most of Leo's advisers and appointees, including the admiral Himerios, the patriarch Euthymios, and the Empress Zoe Karbonopsina, the mother of Constantine VII whom he locked up in a nunnery. The patriarchate was again conferred on Nicholas Mystikos, who had been removed from this position because he had opposed Leo's fourth marriage. During his short reign, Alexander found himself attacked by the forces of Al-Muqtadir of the Abbasid Caliphate in the East, and provoked a war with Simeon I of Bulgaria by refusing to send the traditional tribute on his accession. Alexander died of exhaustion after a game of tzykanion on June 6, 913, allegedly fulfilling his brother's prophecy that he would reign for 13 months. The sources are uniformly hostile towards Alexander, who is depicted as lazy, lecherous, and malignant, including the rumor that he planned to castrate the young Constantine VII in order to exclude him from the succession. At least that charge did not come to pass, but Alexander left his successor a hostile regent (Nicholas Mystikos) and the beginning of a long war against Bulgaria. The sources also accused the Emperor of idolatry, including making pagan sacrifices to the golden statue of a boar in the Hippodrome in hope of curing his impotence. ^ Enumerated after Alexander Severus, and the usurper Domitius Alexander. ^ Ostrogorsky (1969), pp. 261ff. ^ Ostrogorsky (1969), p. 261.